Two of the most poignant female performances in recent decades belong to Meryl Streep and Emily Watson, the latter in Lars von Trier’s “Breaking the Waves” (1996). 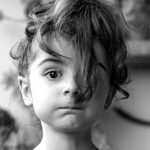 In both cases, aching characters are portrayed by actresses fully invested in the tiniest details of descent, like fine novelists at work with disagreeable but essential sentences. 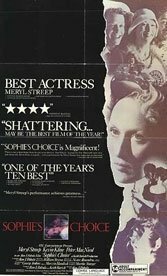 The challenge faced by then-31-year-old Streep in director Alan J. Pakula’s adaptation of William Styron’s book was both overpowering and irresistible. Widowed Sophie Zowistowska is a Polish Catholic refugee who has survived the Holocaust and made it to postwar Brooklyn only to become entangled with an unstable Jewish chemist — Kevin Kline as Nathan Landau — whose ticks and obsessions are driven by rage over the wartime atrocities she’d just as soon forget. Their injured relationship is observed and narrated by friend and new-to-New York southerner Stingo (Peter MacNichol), a thinly-veiled Styron, who is also smitten with Sophie. Though Kline and McNichol are sincere and effective, they rightly defer to Streep’s massive shadow. Extraordinary is her divination of a Polish-American accent. It is bird-like but damaged, lucid but incomplete. She gently forages for space between Nathan’s outbursts in a New York that resents her foreignness. Perfect also is her habitation of scarred Sophie, a wife once forced by the SS to choose between her young children, a boy and an infant girl, events portrayed through flashbacks. Weary heartbreak and linguistic mishap do not compete but instead are in superlative equipoise (to Stingo, wearing a sear-sucker suit: “Stingo, you look… you look very nice, you’re wearing your cocksucker…”). Disbelief usually limits or shoos away screen performance of such sustained grace. With Streep’s Sophie, there’s nothing to disbelieve. Streep learned both German and Polish for the role and earned best actress Oscar honors.